TOPMAN is invading the US this Fall. Topman will be opening its first store in the US at 478 Broadway, Soho. The British retail giant wants to get a share of the American market and offer a vast array of choices to the young and hip Americana. Topman will be competing with Abercrombie & Fitch, H&M Hennes & Mauritz, Zara, Mango and Mexx. The store will feature young and emerging designers displayed alongside established designers or brands such as Topman from a selected country per year. 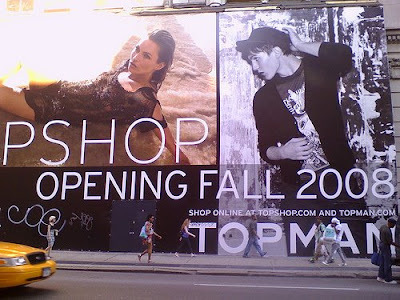 Topman New York Store Opening Fall (October ) 2008 with 40,000 square-foot store filled with merchandise coming from China and India. TOPMAN was nominated for ‘Menswear Design of the Year’ by the British Fashion Council, winner of ‘Best Fashion Retailer’ at the Maxim Style Awards for 2005 and winner of ‘Best High Street Retailer’ at the FHM Fashion & Grooming awards 2007. TOPMAN caters for all budgets , all occasions and all styles regardless of age.